Elijah, 9, taught himself gymnastics by watching YouTube videos and tumbling in his backyard. He hasn’t stopped since, not even through cancer treatment. His dream is be able to do a double backflip and one day make the Olympic team. Elijah Harper sat on the couch in his family’s Akron home, flipping a pencil end over end, moving it through the air to resemble a gymnast flipping across the floor. 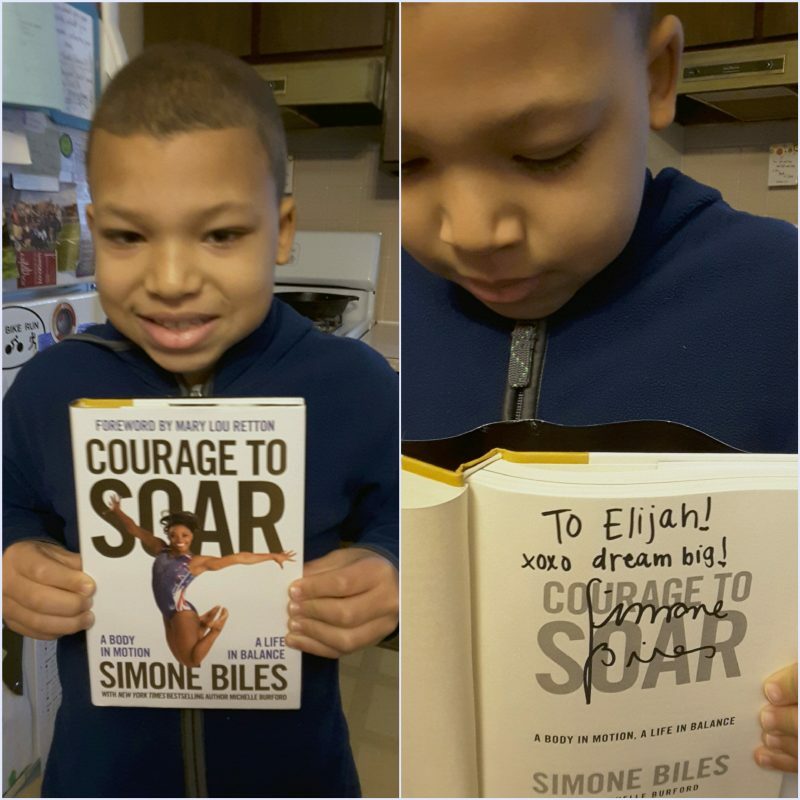 He loves gymnastics and has a signed copy of Simone Biles’ book. Simone is the 2016 Olympic individual all-around, vault and floor gold medalist. “He does this all the time,” said his mother, Pepin Harper. Elijah, 9, taught himself gymnastics by watching YouTube videos and tumbling in his backyard. He hasn’t stopped since, not even through cancer treatment. “It’s part of his life, part of his healing process,” Pepin said, as Elijah demonstrated a backhand spring in their living room. Elijah was diagnosed with medulloblastoma, a type of brain tumor, in June 2015. Pepin had noticed her middle son’s balance was off. He also complained of headaches after tumbling at Riverfront Family YMCA in Cuyahoga Falls, where Pepin is a wellness coach and personal trainer. She thought Elijah might have a concussion. One morning he vomited, so she took him to an emergency room. “They did a CT scan and found it was a tumor pressing against his cerebellum,” Pepin said. The next day, Dr. Tsulee Chen, Akron Children’s Hospital chief of neurosurgery, removed a golf ball-sized tumor from the fluid within his cerebellum. Elijah spent 2 months recovering in the hospital. He went to Chicago for 6 weeks of proton radiation therapy, a highly targeted type of radiation. Then it was back to Akron Children’s for chemotherapy. Elijah, a fourth-grader at Windemere Community Learning Center in Akron, finished a year of chemo in October. Mom Pepin and brothers Isaiah, 10, and Noah, 7, were always by Elijah’s side with their “Team Elijah” t-shirts. Pepin queued up a video on her tablet of his last treatment. Medical staff, friends and family were gathered, cheering for him. Elijah’s hair has grown back, and he’s regained weight he lost during treatment. 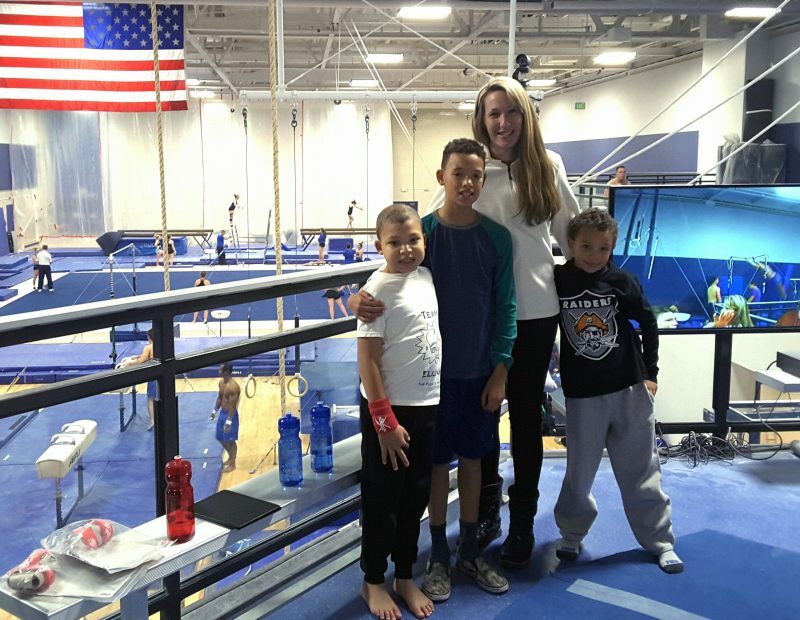 He’s running and jumping with his brothers, Isaiah, 10, and Noah, 7, and he’s back on the uneven bars at American Elite, a gymnastic club in Tallmadge, and tumbling at the Riverfront Y.
Dr. Chen said Elijah was a motivated patient. 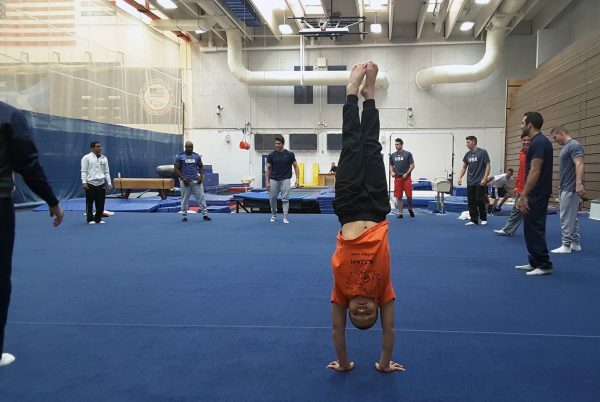 In December, Make-A-Wish of Ohio, Kentucky and Indiana made Elijah’s dream come true when it picked him to work out with the U.S. Men’s National and U.S. Men’s Olympic gymnastics teams in Colorado Springs. 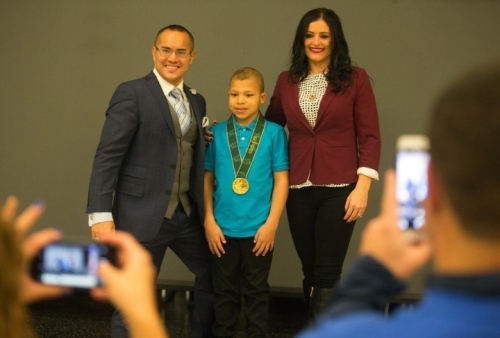 Make-A-Wish surprised Elijah during a school assembly featuring an appearance by 1996 Olympic gold medalist Dominique Moceanu, who placed her medal around Elijah’s neck.